Please scroll down for in-depth descriptions and images of these programs, as well as information on how to get involved! The Reality Store® is a simulation that helps junior high students appreciate the ‘realities’ of life and achieve a better understanding of personal finance. In the Reality Store® simulation, junior high students pretend they are a 28-year-old starting out in their life and career. In class beforehand, they have decided how many children they have (up to a maximum of 3), whether they are married or single, and, if they are married, whether their spouse works or is a "stay-at-home spouse." They then choose a career based on their current GPA and are given a corresponding monthly salary for that career. Students then enter the Reality Store® to spend that monthly salary at 16 different tables representing different aspects of life as an adult. During the 2017-2018 school year, this program was run at 4 local middle schools, where close to 1000 students participated in these events. Over 150 community members volunteered to run the tables at these events this year. ​Volunteering for a Reality Store® is a fun way to interact with students and teach them important lessons. Typically, there are 2 or 3 shifts available at each event, and you may sign up for as many shifts as you like. Let us know if there is a particular table you desire, such as Housing or Pets. ​Please visit our Get Involved! page for information on how to volunteer with this program! The Career Speakers Bureau is a year-round program that brings local professionals into the local high schools to participate in panels consisting of 3-5 speakers. These panels help to introduce students to a variety of career options that are available within a given field, as well as allow students to ask questions about the various professions being presented. These volunteer speakers provide advice to students for their college plans and inform students how to prepare for success in the field. Each panel is focused around a specific career field, such as Medical, STEM, Arts, Public Safety, Social Work, Culinary Arts, Management, and more. ​ Career Days take place once a year at Edgewood Jr. High and at Edgewood High School. This year, we also have an event at Bloomington South High School. The goal of these events is to expose students to career fields with which they may lack familiarity or of which they may be completely unaware. Students hear presentations from different local professionals who volunteered to represent a variety of career fields. ​​Please visit our Get Involved! page for information on how to volunteer with this program! Mock Interview take place once a year for the freshman business class at The Academy of Science and Entrepreneurship. This event provides students with an opportunity to practice their interviewing skills in a safe, supportive environment with an actual professional whom they have not previously met, and allows students to receive feedback and helpful advice for future interviews. 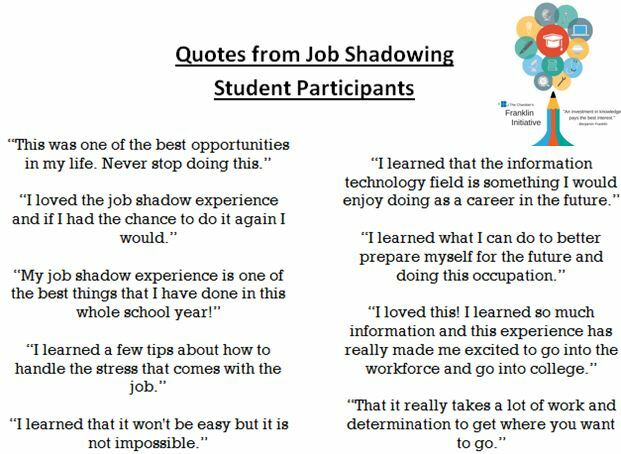 ​The job shadowing program allows high school students the chance to explore careers by observing and interacting with people on the job, for a short period of time (usually a half day). ​ High school freshman from the Academy of Science and Entrepreneurship get partnered with professionals from local organizations who offer careers in which the students have an interest. The Life Sciences and STEM Career Fair is an annual event that takes place at the Ivy Tech Center for the Life Sciences. At this free event, around 25 local organizations representing the Life Sciences and STEM (Science, Technology, Engineering, and Mathematics) fields are on hand to interact with high school students who are interested in pursuing careers in those fields. Exhibitors answer student questions about the different career and education opportunities that are available and provide advice on what steps to take in order to achieve a successful career in the Life Sciences and STEM fields. This year, we had 240 students from 4 high schools attend this event, where they had the opportunity to interact with 25 local organizations and learn about careers in STEM. ​This year's Life Sciences and STEM Career Fair was made possible thanks to our sponsors: Indiana University Health, Cook Group, Ivy Tech Community College - Bloomington, Hoosier Energy, Bloomington Economic Development Corporation, The City of Bloomington, The Community Foundation of Bloomington and Monroe County, and Regional Opportunity Initiatives, Inc.
Exhibitor and School registration is now open! Please email Trevor Owens at towens@chamberbloomington.org to register. ​Please visit our Get Involved! page for information on how to sponsor this program! ​The Employment and Job Skills Fair is an annual event that takes place in the spring. At the Employment and Job Skills Fair, high school students from 7 area high schools will have the opportunity to talk to a wide variety of local organizations about careers in their businesses and companies. Through this experience, students are given the opportunity to make connections for potential summer jobs, internships, and volunteering opportunities. Representatives from HR and professional development groups are also on hand to give students helpful information on interviewing, resume writing, professional behavior expectations in the workplace, benefits, and the impact of social media on the hiring process. This program has been completed for 2017, but will take place again in the spring of 2018. To sign up, be sure to download the information packet below. ​Please visit our Get Involved! page for more information on how to participate in or sponsor this program!